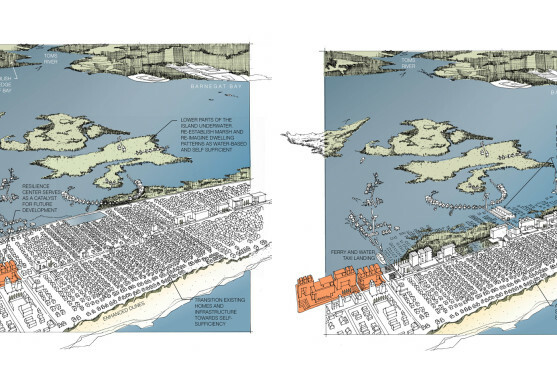 A lot of the research during the Rebuild by Design competition was directed toward changing the pattern of development in inappropriate or threatened coastal areas. Homeowners make decisions for immediate livelihood and investment, but cities have to make decisions for the grandchildren of current residents of flood-prone areas. We had the benefit of discussions with the research advisory group and practicioners including Klaus Jacob, Mindy Fullilove, Tony MacDonald, Alex Washburn, and Vishaan Chakrabarti, as well as the emotional stories of many people affected by Hurricane Sandy. Drawing from these, as well as our own experience in Katrina, we offer the following ideas for a developing a community-based strategy to be fairly and evenly executed over the next fifty years. Create a model framework for planning the transition: land use, allowable density, velocity zone regulations, and location of infrastructure. There are hundreds of miles of shoreline diversity. Provide a parcel-level map of the anticipated sea level rise, by decade, to help decision-making and communication to property owners. Identify areas at greatest risk (sending areas) and appropriate areas for re-investment (receiving areas). Communicate the increase in frequency and impact of severe weather due to climate change. Remove the ability to rebuild on repetitive loss sites by eliminating grandfather rules. Remove the insurance safety net which allows risk behavior. Plan a mortgage-horizon pattern for 30 years, making it increasingly difficult to hand down repetitive loss properties to future generations. Use the (average) 7 year ownership cycle to buy out target properties. The government once recruited people to the coast with improved transportation and tax abatements. Remove these supports in endangered places, and people will relocate elsewhere. Identify the costs of displacement and distress BEFORE an event versus AFTER. Provide assistance for low-income residents. Avoid piecemeal destruction of neighborhood, one house at a time. As one house goes, so goes the street and then the neighborhood. Relocate streets and neighborhoods together to ensure social solidarity and restore community. Properties in threatened areas may be allowed sacrificial structures for seasonal use, if unmortgaged, uninsured, unconnected to the grid, and not eligible for compensation when damaged. It is one thing if everyone is giving up their house to nature, but quite another to selectively relocate and allow a developer to plan high-income development in its place. All properties turned over must become publicly accessible, candidates for restoration and removal of unnecessary infrastructure. Work not only with target community, but also neighboring jurisdictions and the state to support changes and authorize implementation. Illustrate desirable new communities, and waterside edges restored to nature. Make the transitional strategy clear in advance of scheduled milestones, to delineate the social advancement possible in moving forward. “City Life is Moving”: give the plan a name, logo, map, and timeline to brand the plan and engage public communication.